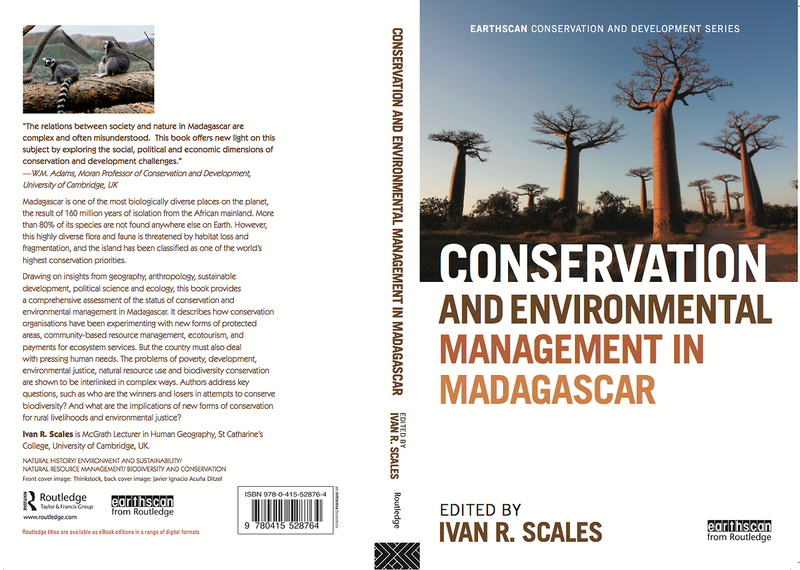 We build our detailed case in a chapter in the new book Conservation and Environmental Management in Madagascar, edited by Ivan Scales. We outline the history of efforts to measure forest extent and its loss on the island of Madagascar. We show how the 90% figure (and its close relatives) is not based on defensible evidence. And we argue that this figure persists, despite the lack of evidence, because it has power: it fits with certain preconceived ideas about the gravity of the island’s environmental crisis. Deforestation trends are dramatic enough in some parts of the island that there is no need to exaggerate. These exaggerations are even potentially harmful in that they can undermine scientific authority, put blinders on the types of questions that are asked, and push to the sidelines important debates about the impacts of strong conservation policies on rural people. That a general trend of forest loss can be shown. Comparisons of data derived from historical aerial photography and recent satellite imagery appear to be converging on an estimate that as much as half – but perhaps much less – of the most easily identified ‘primary’ forest types changed to other land covers since 1949-1950. That regional studies demonstrate dramatic trends in particular regions for particular time periods. Harper et al. (2007), for instance, highlights the impact of clearance for maize cultivation in the dry forests around Tulear in the last few decades, or my recent work (Kull 2012) documents the extent of afforestation by pines and eucalypts in the highlands. We also showed how over two dozen peer-reviewed studies (and countless guidebooks and websites) have repeated the 90% figure first asserted by colonial naturalist Henri Perrier de la Bâthie back in 1921. The citation trail for these assertions is surprisingly poor. Its persistence reflects the strong hold that a particular conservation-oriented mindset has on scholarly and other writing about Madagascar. Authors inevitably describe the island as both highly biodiverse and highly threatened, and the 90% figure helps them dramatize the case for conservation actions. In their response to our letter to Science, the authors of the study we critiqued for using the 90% figure (Christoph Schwitzer and colleagues) essentially agreed with our stance. They retracted their statement that “Remaining intact forest habitat was estimated to cover 92,200 km2 in 2010, only 10 to 20% of Madagascar’s original forest cover“, changing it from a statement about forest cover change to one about surface area: “Remaining intact forest habitat was estimated to cover 92,200 km2 in 2010, only 10 to 20% of Madagascar’s surface” (emphases added). 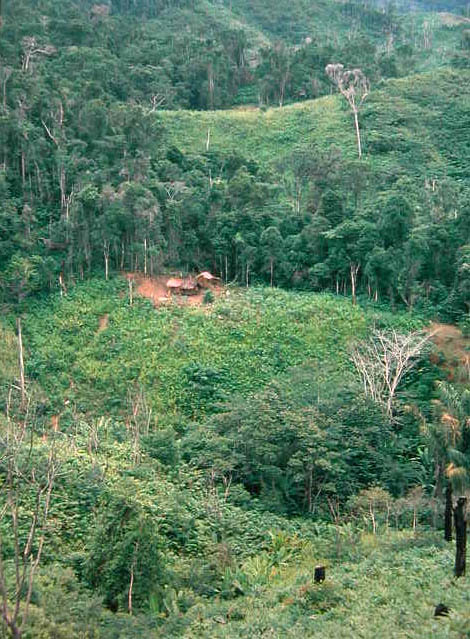 And they essentially agree with our “cautious” but still “substantial” conclusion that recent deforestation involved up to half the forest area found in 1950 – though they seek to push the upper bounds of the envelope by offering a simple comparison of statistics from studies using different methodologies (which we critique in the chapter). The discourse of exotic nature and environmental destruction can be seen as necessary to justify conservation fundraising, policies, and actions. Yet, as Richard Peet and colleagues (2011, p. 37) state, “arguments over the apparently ‘given’ facts and categories of ecology are always also arguments over social and political control of nature”. The dominant narrative and its exaggeration of forest loss contribute to strong conservation policies and actions that marginalize rural people, restrict their access to resources, and silence their viewpoints (see other chapters in Conservation and Environmental Management in Madagascar). More careful use of data can support more appropriate debates and policy, and may help us to better avoid the further reduction of the island’s forest cover – so that, in the future, we won’t be in a position to show that 90% of tree cover documented in the mid-20th century has actually disappeared. Harper, GJ, MK Steininger, CJ Tucker, D Juhn & F Hawkins (2007) Fifty years of deforestation and forest fragmentation in Madagascar. Environmental Conservation 34 (4):325-33. Perrier de la Bâthie, H (1921) La végétation Malgache. Annales du Musée Colonial de Marseille Sér. 3, v. 9:1-266. Peet, R, P Robbins & M Watts (2011) Global Political Ecology. London: Routledge. This entry was posted on Friday, April 25th, 2014 at 10:54 pm and is filed under Conservation, Madagascar, Political ecology, Research. You can follow any responses to this entry through the RSS 2.0 feed. You can leave a response, or trackback from your own site. You conclude that as much as 50% of Madagascar’s most easily identified ‘primary’ forest types has changed to other land covers since 1949-1950. Please could you say approximately how many hectares this refers to in 1949-1950 and in the present day? I understand from your chapter in ‘Conservation and Environmental Management in Madagascar’ that estimates of forest cover are riddled with inconsistencies and methodological caveats so it would be most helpful if you could advise which are the most accurate estimates (or estimated ranges) for these dates in your opinion. I ask because I would like to make sure that the NGO I work for is being as accurate as possible with our communications and not perpetuating the 90% deforestation myth. The other percentage that you provide is most helpful but the corresponding number of hectares would also be great. Ps. I think there is a pdf link to this chapter in the reference list to the blog post; if you email I could also send it to you. Thank you very much, this is really helpful! Could this mean though that there is a small (hypothetical) possibility that ‘forest cover’ increased from the lower estimate of 16 million hectares in the middle of the 20th century to the upper estimate of 17 million hectares by the end of the 20th century? I had skimmed the chapter (thank you for pointing me to that page), which basically brought me to the conclusion that estimates of ‘forest cover’ are so dependent on categories of vegetation included etc that it’s very difficult to say with much accuracy how things have changed over the years. I still cringe though whenever I see the 90% figure being quoted (Ivan Scales was one of my Geography lecturers at Cambridge and I’ve been working in Madagascar for several years since then), and try to point them to your papers whenever possible. It’s great to be able to suggest “as much as 50% of Madagascar’s most easily identified ‘primary’ forest types has changed to other land covers since 1949-1950” as the more evidence-based alternative now. Thanks for your enthusiasm, Laura. No, while the mid-century (16-20 mha) and recent (9-17) forest cover estimate ranges overlap, I don’t think there is any justifiable case to be made for using the two extremes to suggest there is a possibility of forest increase (from 16 to 17). There are, of course, specific regions with dramatically increasing tree cover over the past half-century, but this is generally not of native forest but heavily-exploited woodlots and charcoal-producing invasions: it is eucalyptus-pine-wattle in the highlands; grevillea in the eastern lowlands. In many of the forest frontiers (humid and dry) outside (and sometimes inside) of the protected areas that the government and conservationists are working hard to protect, forest is still being cleared.